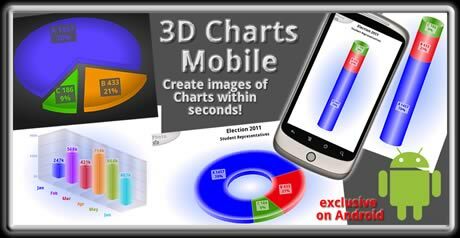 Create astonishingly good looking 3D Charts within seconds. Visualize and share data instantly! Yet it might take a few moments to learn all about this powerful tool. Please do read this short manual thoroughly. All Charts are grouped in 3 different types. Choose a group. Toggle the app's background theme (black & white). Force Stop (Exit) the Application (saves some battery, will prevent the app from multi tasking). Info pop-up with support mail and links, User Manual. Toggle fullscreen mode, show/hide notification bar (nice for multi tasking, consumes image size). The back key always takes you to the previous screen and closes any pop-ups select boxes and color picker without setting new values. Here a few images in (small portrait, extreme 3D to 2D, original size reduced by 50%) rendered with the same datasets of the above figure 2 but with different rotation and 3D 2D Camera settings each. The last image shows an anomaly. Not enough room for proper big size 3D rendering. To avoid this do set the width and height to more quadratic values and go down with the 3D-2D slider value. The first image is extreme 3D positioning. That consumes height even in portrait. In landscape you can render very big charts! You definitely should play around with testing Landscape and Portrait mode. The width / height sliders are in percent of the stage / screen size. Just remember your mobile device features high resolution DPI dots per inch screen compared to a desktop monitor. This means Chart images will look way bigger on PCs. Tablets and Smartphones with high screen resolutions (ppi points per inch) are supported and can render even bigger graphing images. Tick that check box called 'fx' next to the caption to add a button type effect to the same as well as to the legend if rendered. Set number prefix like '$ � � �' or suffix like 't' or 'k' for tonnes and kilo even '%'. For the Combination Chart's canvas one can set a maximum value below the highest value of the elements as highlight effect. These max and min values are calculated automatically if left blank. The minimum can be above zero. The slicing option of the pie percentage charts can be turned off to save space. Tap on the topmost piece of a staggered chart to toggle slice all. Scaling font size and even percentage number precision can be set. For scaling note that you should prepare the value precision (this is about the only deference to Advance-Media's web based interactive animated and real time database charting software tool). 1000 can be turned by scaling to 1k and 1500 to 1.5k yet 1547 will be rendered as 1.547k so use zeros. M stands for Million! Official SI abbreviations. Value 3D-2D aspect ratio slider for Cone Charts: Known issue here is that a Cone Chart is rendered properly up to about 25 aspect ratio only. For all staggered types note that the first data row will appear at the bottom ... one starts to build a house with the bricks of the base foundation. The bevel slider rather sets the bevel brightness. Pie and donut radar/polar will look better in landscape and a staggered column is preferable in portrait. The text layout changes to the left right or around any percentage charts in landscape mode. A pyramid cone and funnel chart can be rendered upside-down by turning your device upside-down while the text will remain right-side-up. The 3D line of the Combination Chart is hollow at the bottom. This means it will look better if rendered either in 2D or having an increased camera angle. The line's 3D thickness is a true miter calculation which need some space. So don't try to render 300 data points with a screen width of 400 pixels, use a different chart type! Combining different Chart types for multi series charting definitely increases the visual distinction of each series in 2D as well as in 3D (see multi series images above). So there is no need any more for a difficult to read 2D clustered or staggered charting approach to depict multi series. For all canvas charts one can set a maximum value below the value of the elements as highlight effect. These max and min values are calculated automatically if left blank. The minimum can be above zero. 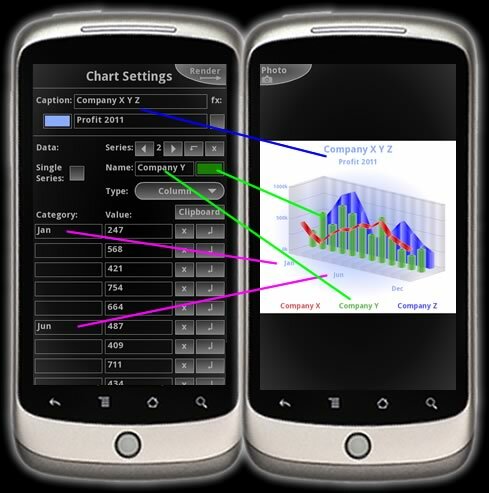 Add extra limit average or trend lines to the Combination Chart's canvas. Required here is a 'Start' value only. All further fields are optional. The name of such an additional line if left blank will show the start value on the scale, if the name is is filled with a single blank SPACE like ' ' than no value at all will show yet this name could be any string like 'Average ' (extra spaces appended can avoid overlapping) or 'Limit 5-6'. The 'End' value can be used to draw a slant line. It represents the height of this line on the right side of the chart's canvas. You may think about the 'Zone' value as thickness of the drawn line. This thickness value depends on the scale of the y axis. For example if you render a chart with a range between 0 and 10 and the zone value is 2 and its start value is 5 than this zone will fill an area on the canvas from 4 up to 6. Any surface graph is native in 3D and inherently requires a minimum of two consecutive series to render. 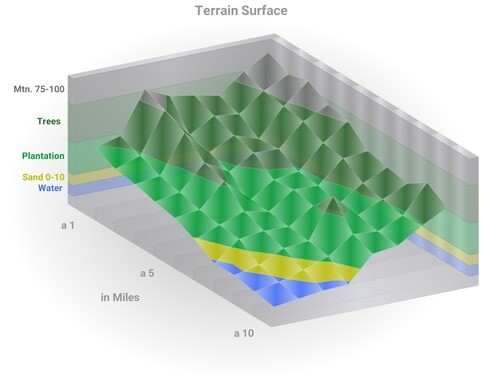 Two different types of surface charts do exist. Surface colored by series and surface colored by height or so called region (fractal calculation). The afore mentioned additional limit or average lines serve as switch to toggle between these surface types. Surface colored by the series will show if no extra line is added. When adding lines while rendering a surface chart the system will switch to colored output by height or region. In this case the 'End' and 'Zone' values of these additional lines can be neglected. Do start with the first region at the bottom of the chart. If the Chart is scaled from 0 to 10 and the first line is having a start value of 2 than this will output a region from the bottom 0 up to 2 and if adding more regions like next 'Start' value set to 4 and 6 8 and 10 ... than one gets a surface having colored regions from 0-2, 2 up to 4, ... 8-10. Also he alpha transparency of each series is used even for the colored by region surface type yet the alpha transparency of the very first (0-2 of this example) region determines the alpha value of all the regions lines on the canvas. Set this value to 0 to completely hide these additional lines or zones on the canvas. If the 'Divisional Lines' field (below) is left blank no such values will show even for the colored by height surface chart and you can add your own scale values by adding an alternative scale manually to the 'Name' of the region (line) like 'mid. 2-4'...'4-6' etc. Floating Area floating Column floating Cylinder and Bubble require 2 values per element, high and low or maximum and minimum (bubble charts with this setup perhaps look best in 2D, rotation supported up to 89 in theory, more than 7 or 8 bubbles are rare because bubbles consume space on the x-axis). 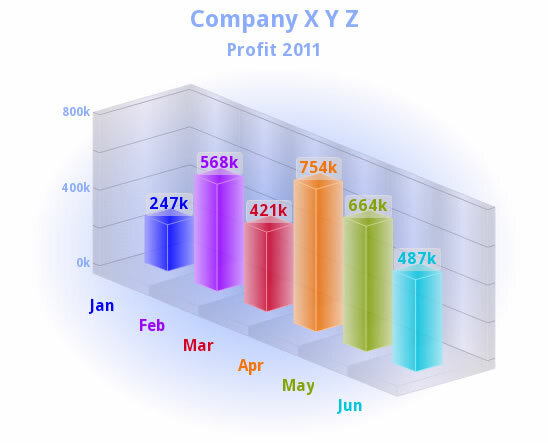 The range value cap of floating Charts will be visible only if the respective cap field is populated. The canvas can be hidden by setting Alpha to '0' and the values of the divisional lines can be hidden by supplying a blank instead of a number in the respective input field. 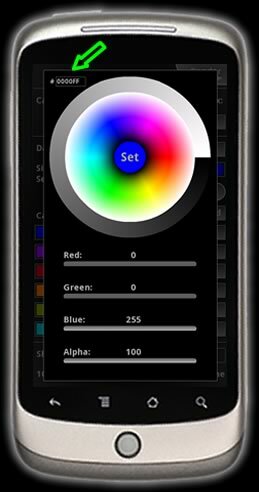 The Color Picker pops up after tapping on a color field in the Chart's Settings. The center of the color doughnut shows the selected color and alpha transparence (if available, see slider bar). Tap on the center to set this color. The green arrow in the figure points to the hexadecimal color text field. There one can copy and even paste (select, long press) values too. Tip: Choose brighter colors for a dark background and darker colors for bright background. You will find the Save As Options in the Chart Settings close to the bottom of the screen. Choose between jpg and high quality transparent png or jpg file with customized compression there first. The 'Photo' button of the render preview screen will toggle to 'Saved' or 'Error' after clicking. 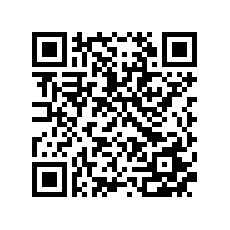 Go to Android's native Gallery App and pick up (share attach) the saved image from there afterwards. The jpg file with customized compression may take 1~2 seconds to calculate. 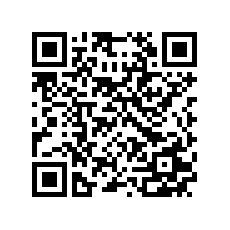 FYI: This app is available exclusively on Android due to the excellent Adobe Air support. 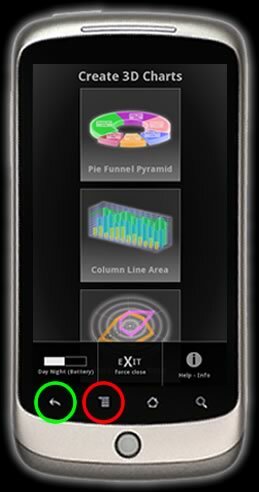 Wishing fun with mobile 3D charting, be convincing, be successful! The software comes in an as is condition.